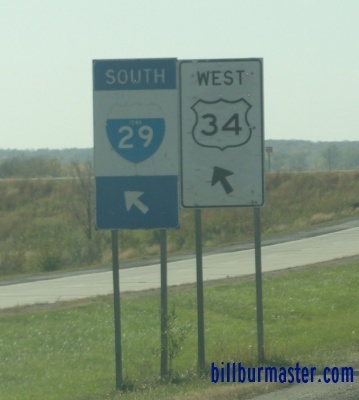 Interstate 29 is the north-south interstate on the western border of the state. 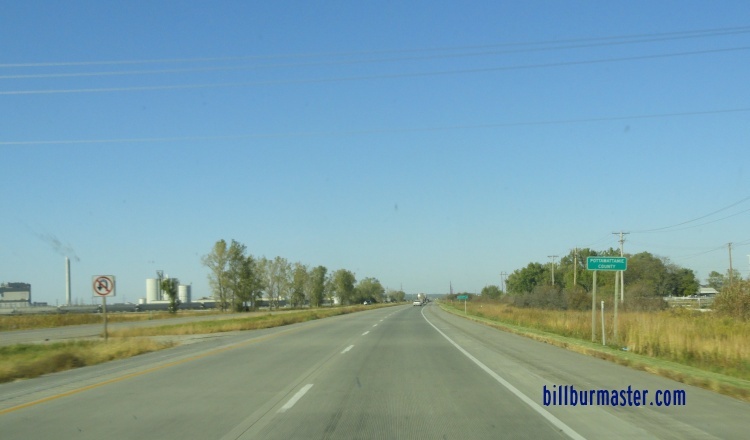 This runs from the South Dakota State Line, near Sioux City, south to the Missouri State Line, near Hamburg. 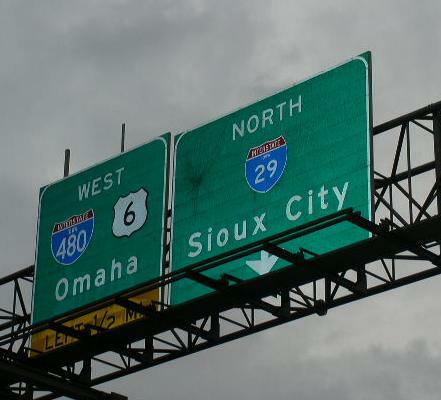 This highway has one spur at Sioux City. 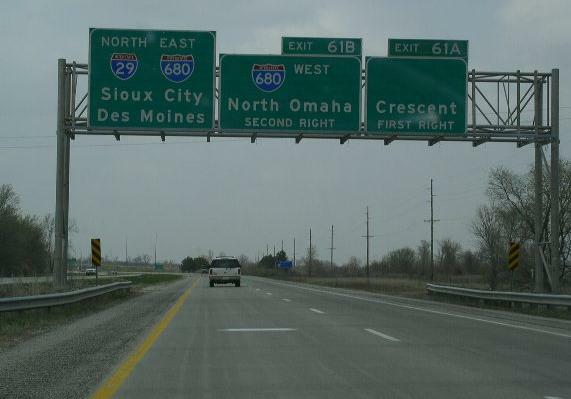 In Iowa, I-29 is multi-plexed. ...U.S. Rt. 34, near Pacific Junction. ...U.S. Rt. 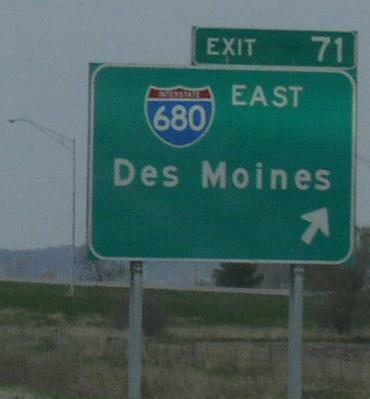 275, from near Glenwood to Council Bluffs. 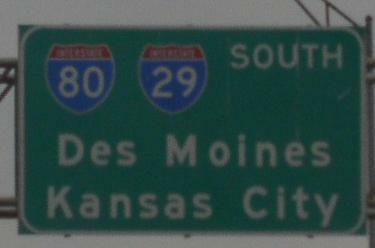 ...Interstate 80, at Council Bluffs. 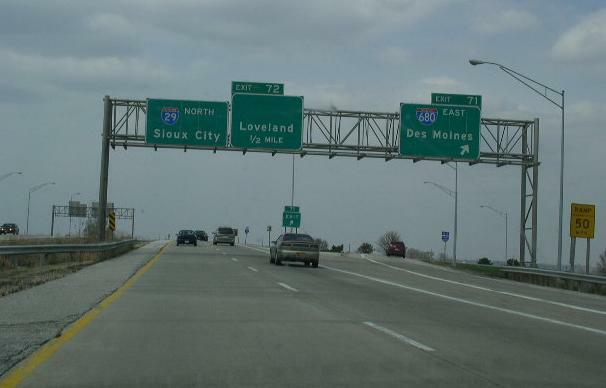 ...Interstate 680, from near Council Bluffs to near Loveland. ...BUSN U.S. Rt. 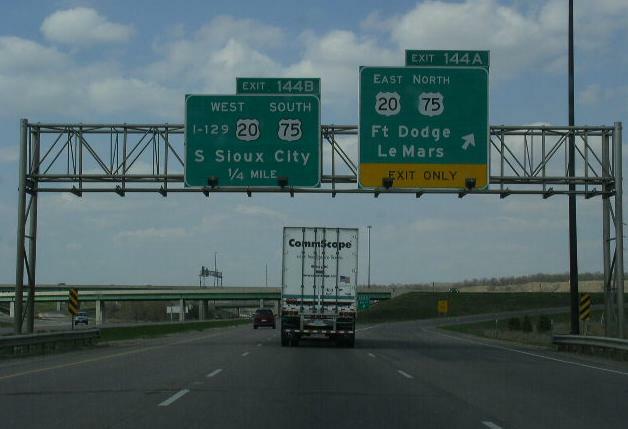 75, at Sioux City. 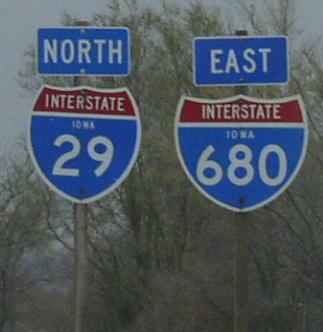 Interstate 29 crosses the following interstates in Iowa. 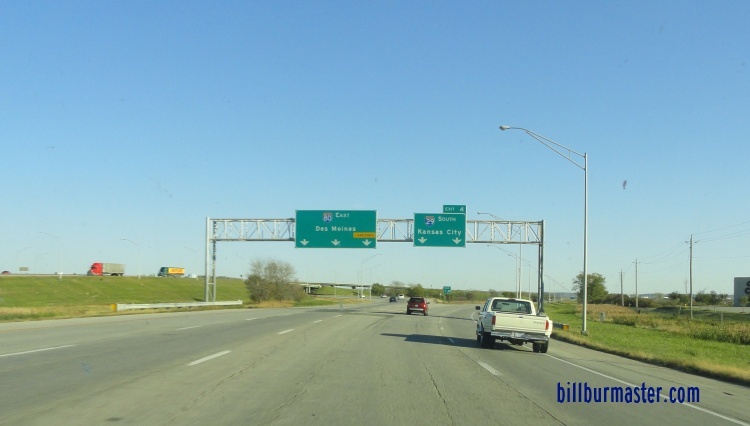 Interstate 80, at Council Bluffs. 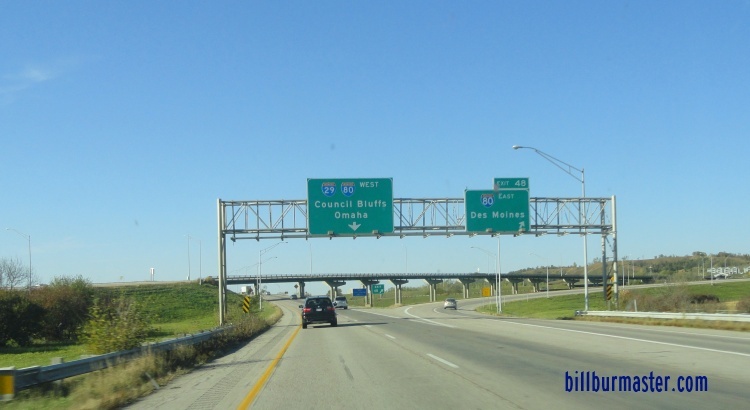 BGS on SB I-29/EB I-80. WB I-80 over one mile from SB I-29. 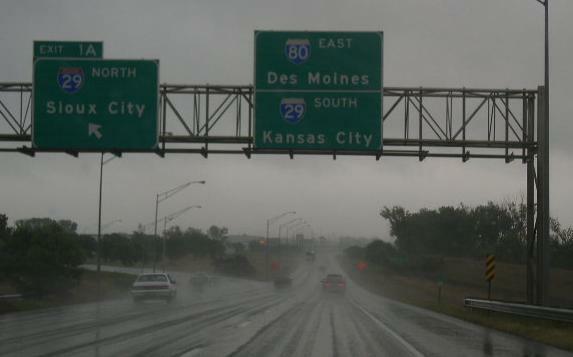 WB I-80 near SB I-29. 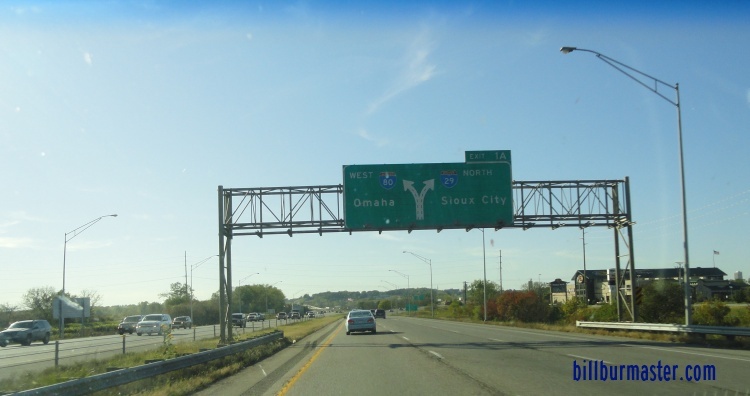 WB I-80 at SB I-29. WB I-80 over one mile from NB I-29. 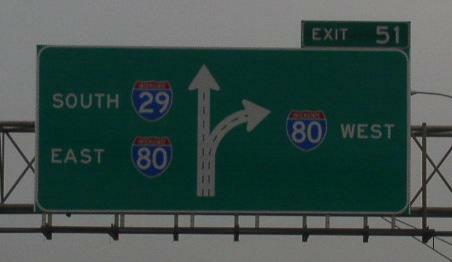 WB I-80 near NB I-29. 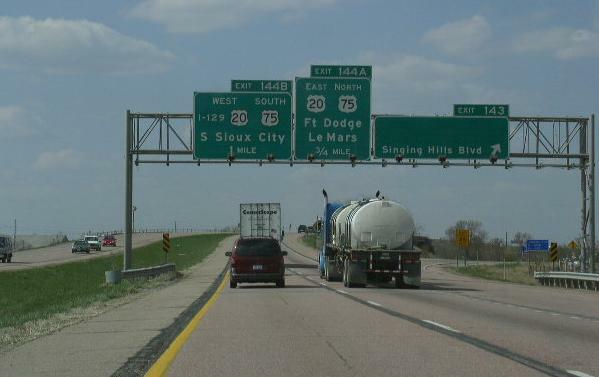 WB I-80 at NB I-29. 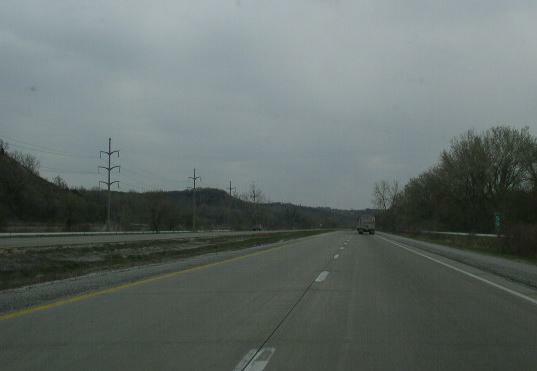 BGS on SB I-29, near I-80. 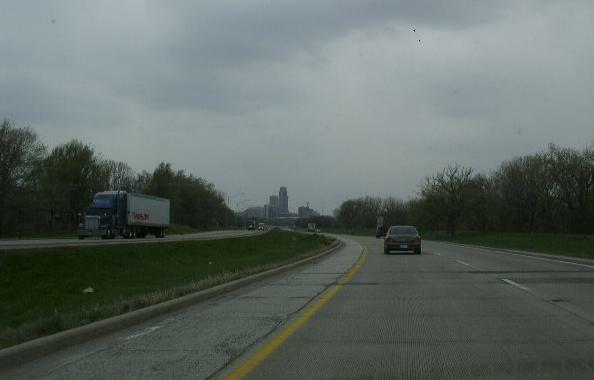 Interstate 480, at Council Bluffs. 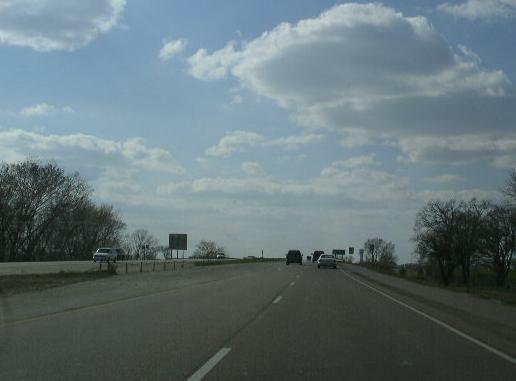 The first BGS on SB I-29. 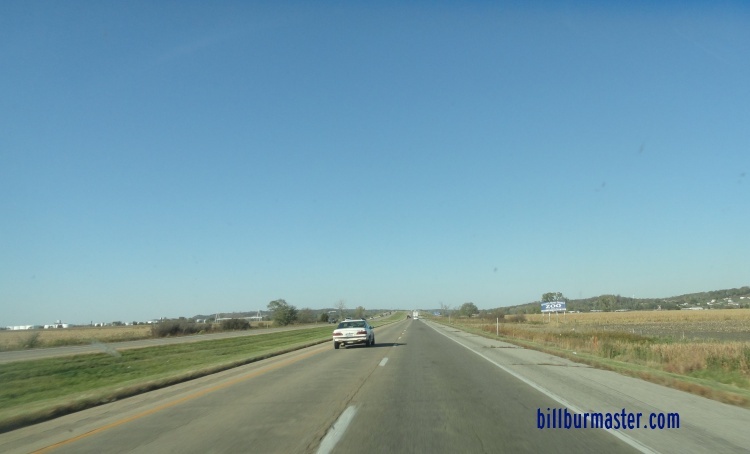 Interstate 680, near Council Bluffs. 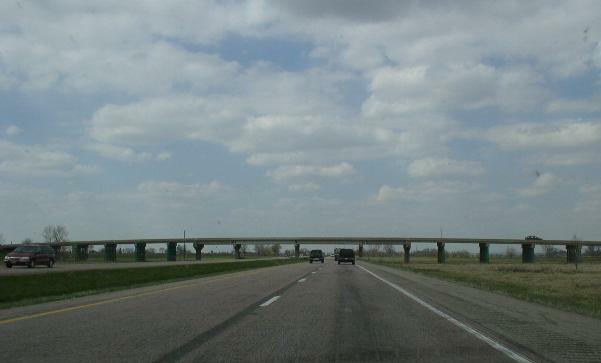 the one mile BGS on NB I-29. Overhead BGS's on NB I-29. 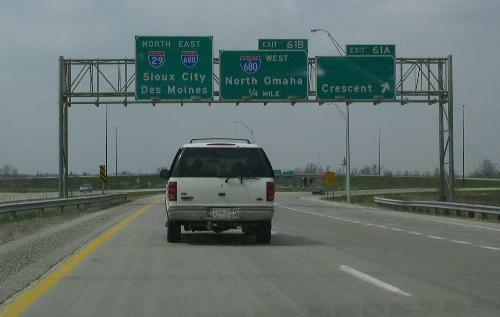 NB I-29 near WB I-680. NB I-29 at WB I-680. 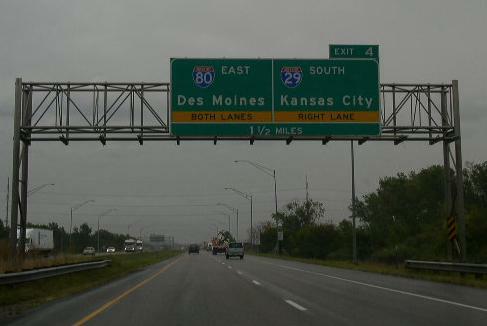 The two mile BGS on NB I-29/EB I-680. 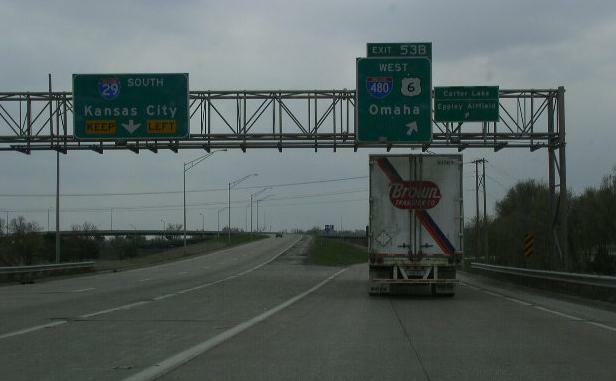 Overhead BGS's on NB I-29/EB I-680. 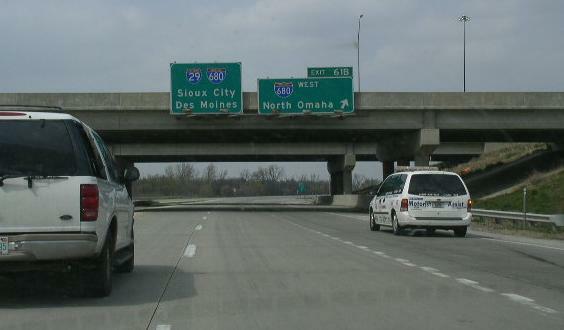 A BGS at EB I-680 on NB I-29. 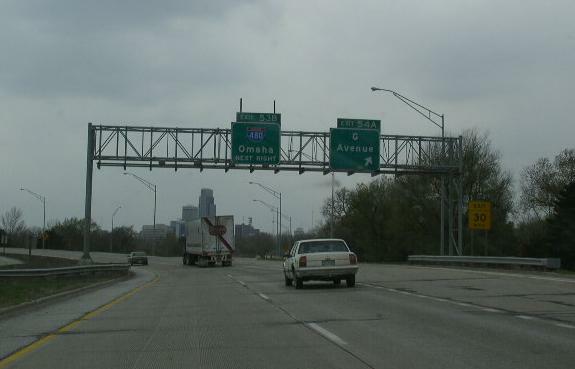 The split of NB I-29 and EB I-680. 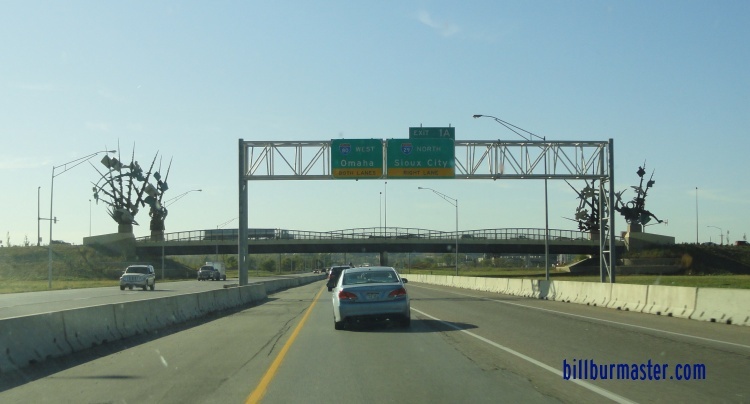 Interstate 129, at Sioux City. NB I-29 one mile from I-129. 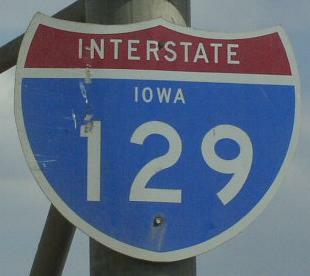 NOTE: "I-129" is spelled out instead of a shield. 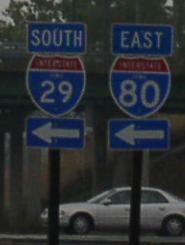 NB I-29 at the interchange with I-129. 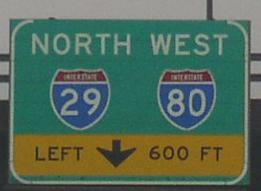 Overhead sign on NB I-29 at I-129. 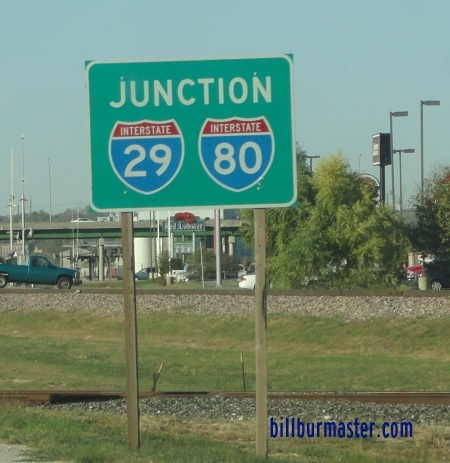 NOTE: Again the spelled out "I-129", and the lack of control city for I-29. 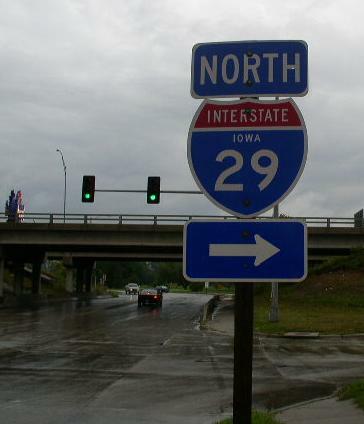 Branches of I-29 in Iowa. 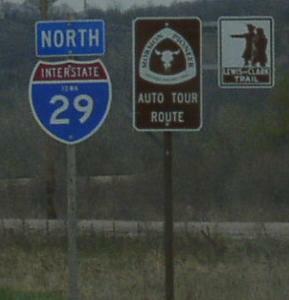 A guide marker on WB U.S. Rt. 34/NB U.S. Rt. 275. 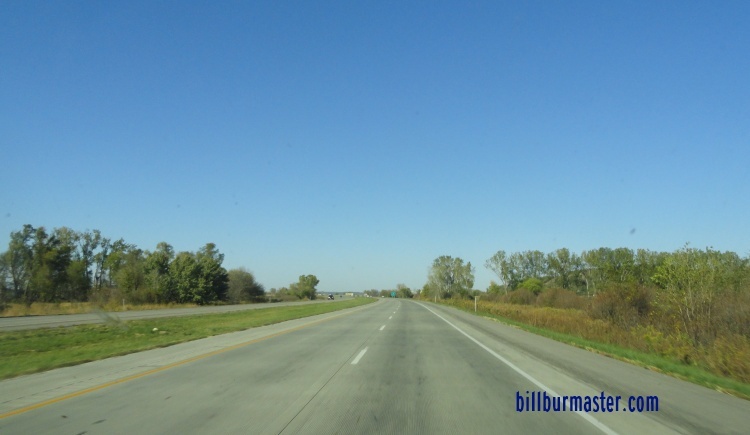 NB I-29/U.S. Rt. 275 near Glenwood. 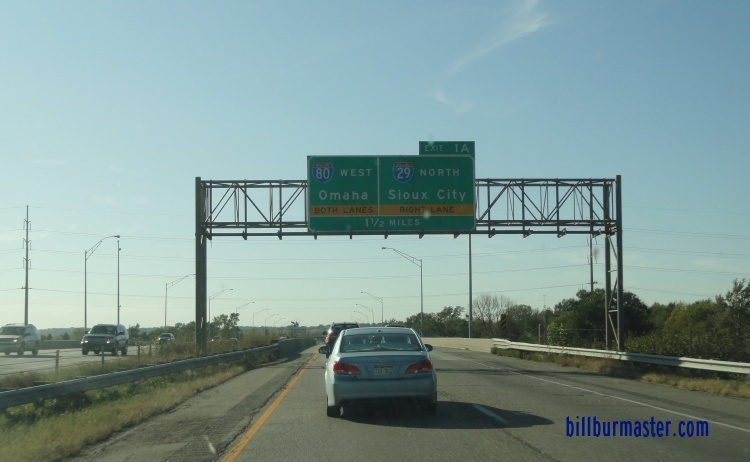 NB I-29/U.S. Rt. 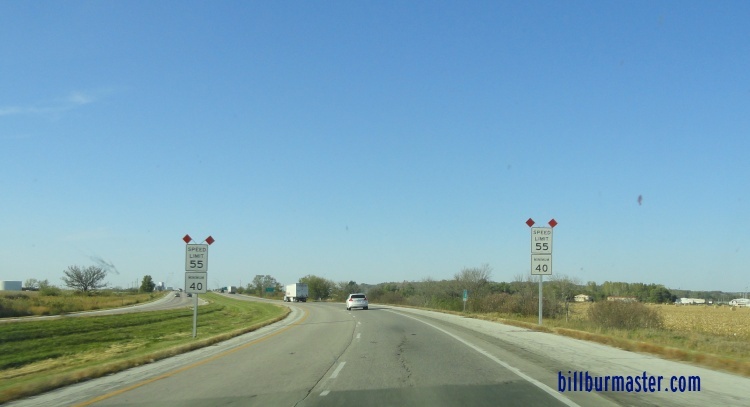 275 at the Mills/Pottawatamie County Line. 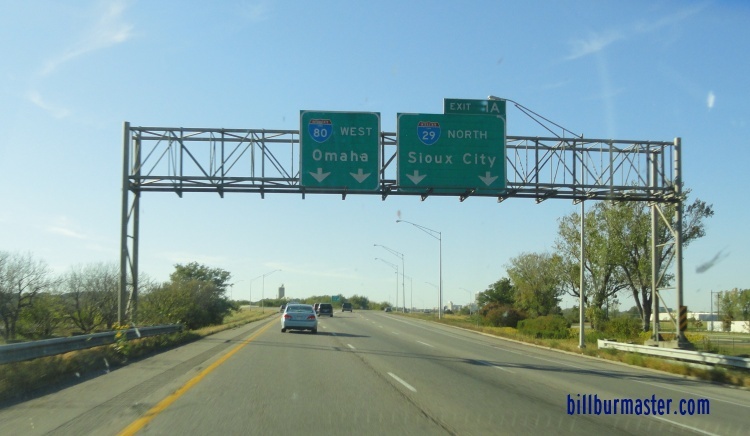 NB I-29/U.S. Rt. 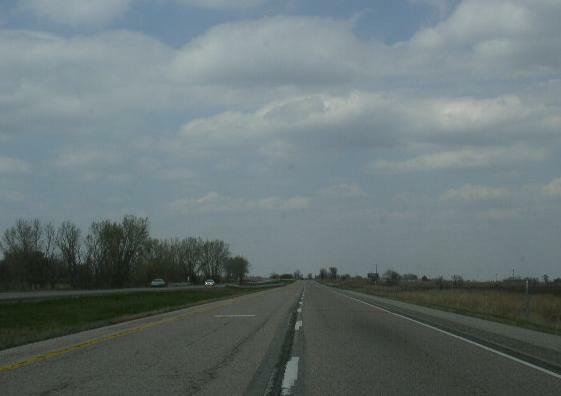 275 north of IA St Rt 370. 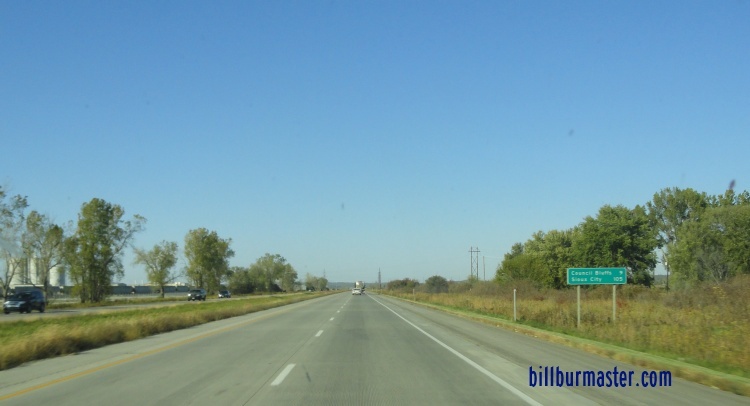 NB I-29/U.S. Rt. 275 south of Council Bluffs. 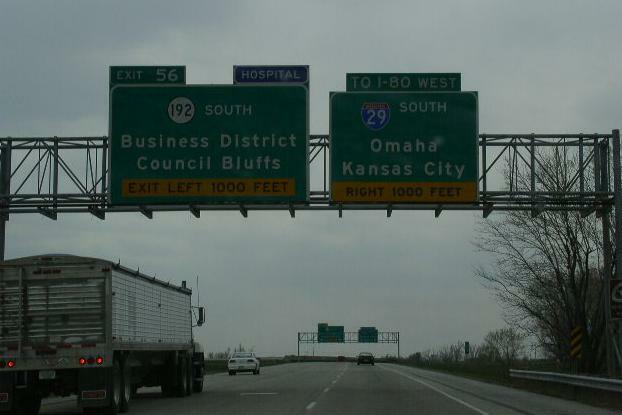 NB I-29 in Council Bluffs. 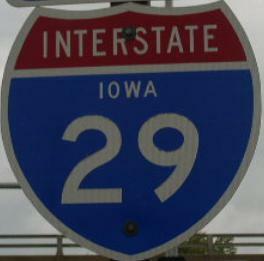 NB I-29 at the flyover ramp from WB I-80 to SB I-29. 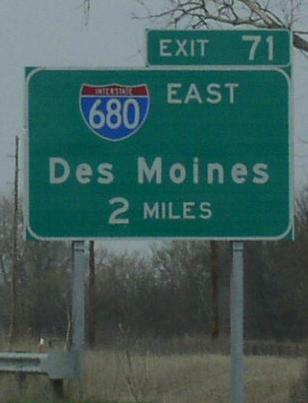 A junction marker in Council Bluffs. BGS on NB IA St Rt 192. A guide marker on 9th Ave in Council Bluffs. 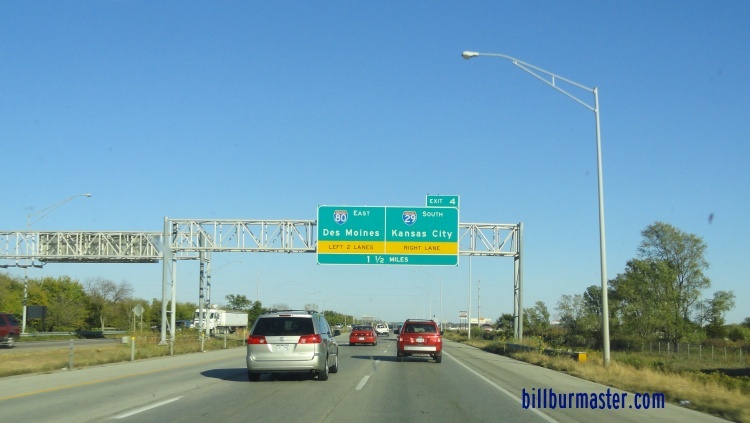 SB I-29 in Council Bluffs. Downtown Omaha, Nebraska is in the view. 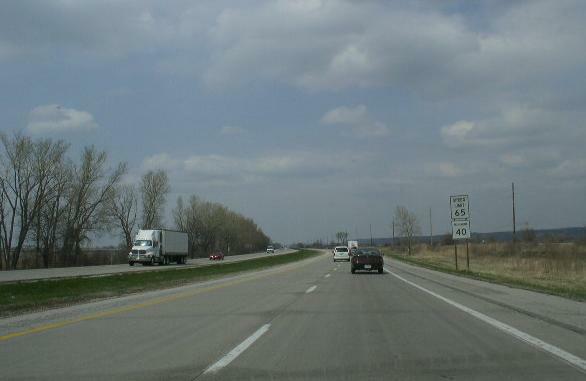 SB I-29 at IA St Rt 192. 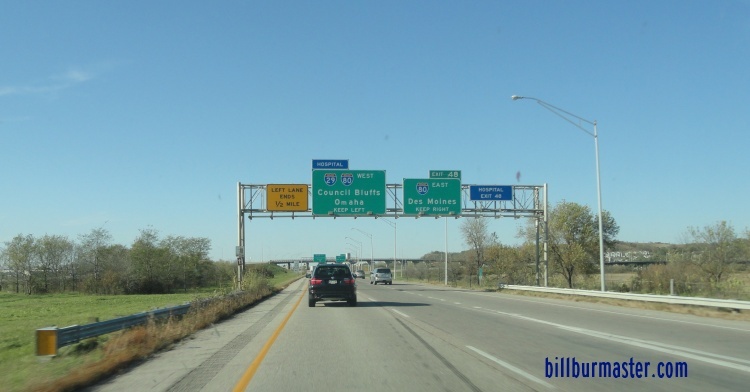 A set of guide shields on NB I-29 at Council Bluffs. 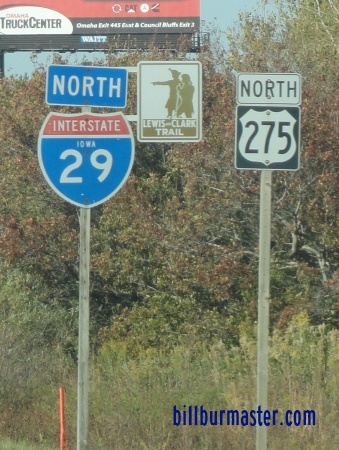 I-29 is part fo the Morman Pioneer Auto Trail and the Lewis and Clark Trail. 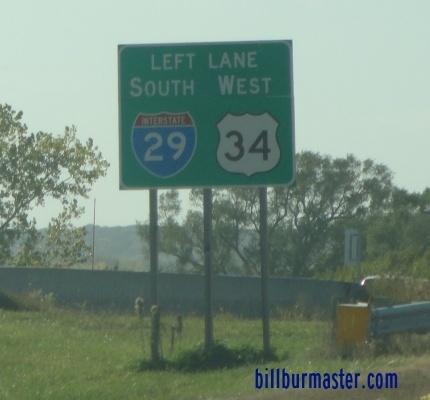 SB I-29 north of Council Bluffs. 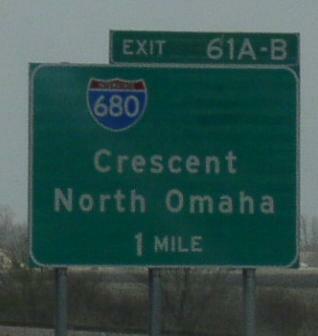 NB I-29/EB I-680 near Cresent. NB I-29 near Sloan. 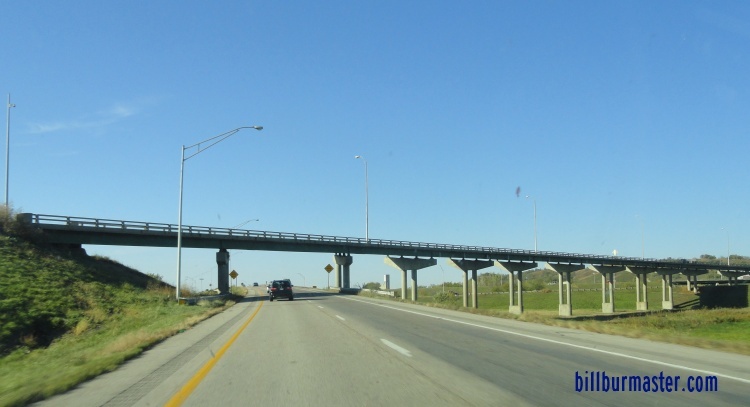 NOTE: This overpass uses piers instead of embankments. 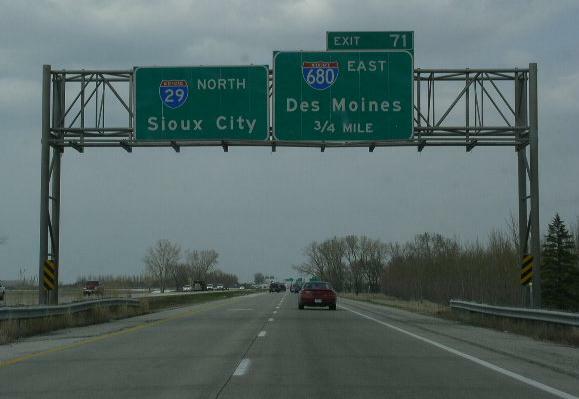 NB I-29 south of Sioux City. 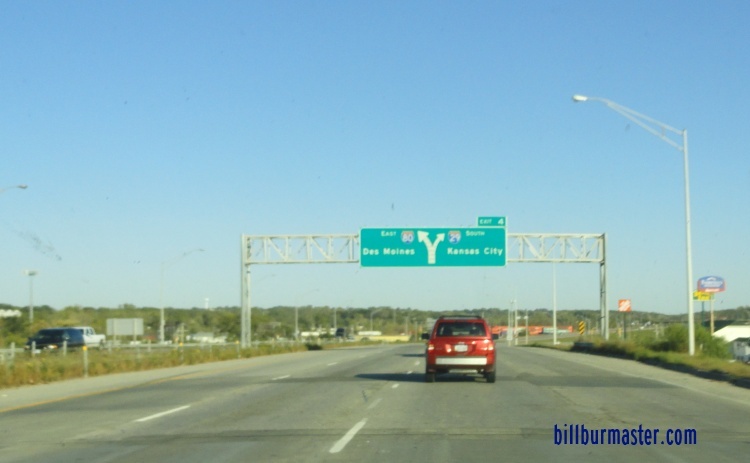 A set of older BGS's on SB IA St Rt 12 in South Sioux City. 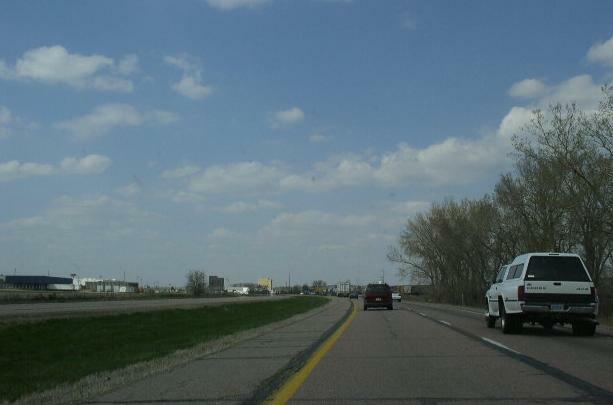 NB I-29 south of the Iowa/South Dakota State Line.